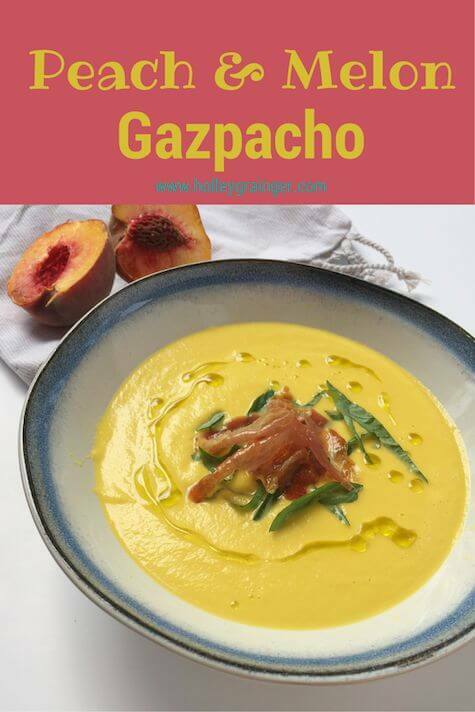 Blended with sweet melon, juicy peaches, and cooling cucumber, this Peach-Melon Gazpacho with Prosciutto is an absolutely delicious and fresh way to enjoy the summer. Fresh from the Garden: The season of bountiful produce has arrived. 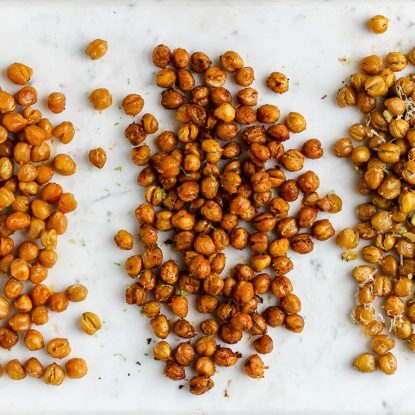 Whether your produce comes from the farmers’ market, a CSA share, or a plot of dirt out back, show how you are using fresh July fruits or veggies. And if you have gardening successes – or failures – please share! Some HC thoughts: Nearly all of my produce comes from my local farmers’ market. Mid-July is the perfect time for fruit in Alabama – the melons are magical, the berries bountiful, and the peaches perfection. As someone who dearly loves her Vitamix, I jumped at the chance to create a recipe with it that could help beat the summer heat and use fresh local fruit. 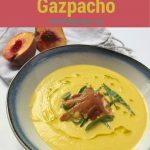 Blended with sweet melon, juicy peaches, and cooling cucumber, this gazpacho is absolutely delicious and tastes the way mid-July should. A fruit soup may seem a little peculiar, but trust me on this. You will not be disappointed! 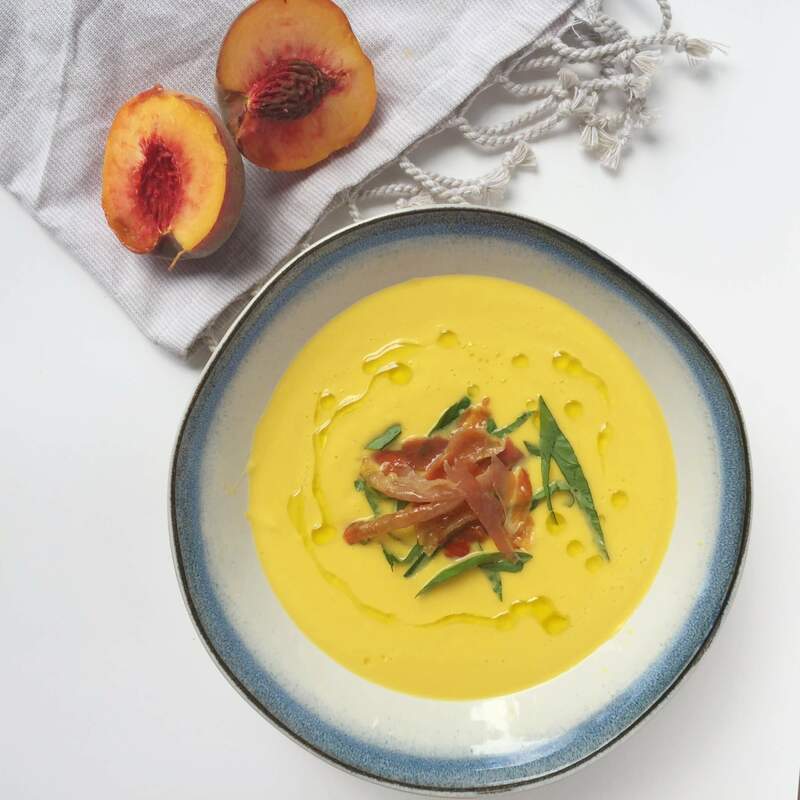 Check out Hannah Claire’s recipe below for a fresh peach-melon gazpacho that blends together farmers’ market fresh peaches and melons with sweet onions and crispy cucumber. I love how she incorporates a salty hit with the prosciutto crumble on top. So what do we think? Did her recipe make a passing grade? Two thumbs up from this preceptor!! 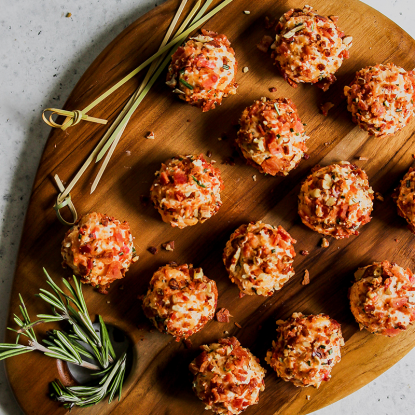 Preheat oven to 325 F. Place prosciutto slices on silicone mat or parchment-lined baking sheet. Bake for 8-10 minutes or until crispy. Remove from oven and crumble. Set aside. 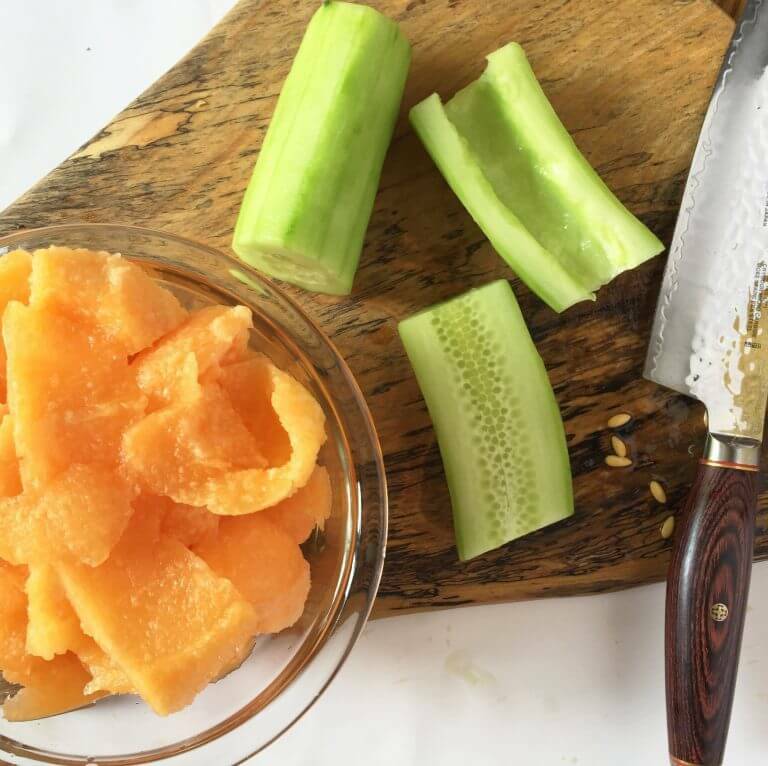 Place melon, cucumber, peach, and onion into blender. Blend on high until smooth. Add oil, vinegar, and salt. Blend until incorporated. Pour blended mixture into medium-sized bowl and cover with plastic wrap. Chill in refrigerator for at least an hour before serving. Before serving, top gazpacho with crumbled prosciutto and basil. A quick-to-prepare chilled summer soup that pairs beautifully with prosciutto and basil. This sounds so good! It’s the perfect summer soup recipe…I love the salty sweet combination with the prosciutto and melon. I can’t wait to give it a try! i love gazpacho in general but never thought about tranforming peaches and melons into one. 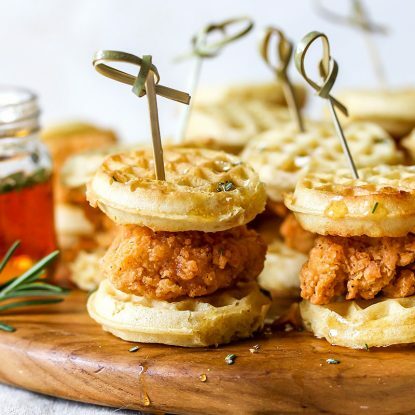 lovely recipe. My problem with gazpacho is they are always so thin. This looks thick, creamy and delish! This one definitely has a thicker texture but I know exactly what you mean! I love gazpacho! Never made it with peaches before. Looks fab, especially that color! WOW! Talk about a fresh summer dish! You really can’t beat this combination of ingredients! Especially when they are fresh from the Farmers’ market. I bet this is simply amazing! So pretty too!